Happy Birthday, Julee!! Party On! Talk about Diva-licious!! Today is the #1 Diva herself, Julee Tilman's Birthday!! In case you aren't in the know, Julee is the owner and artist extraodinaire of Verve Stamps! So today, we are having a little par-tay for her over in the Verve Forum on THIS POST. You can even win a birthday present! 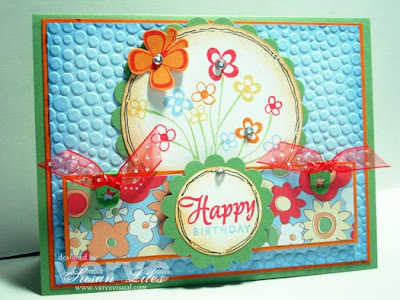 Go check it out, wish Julee an HB and see the other Verve Divas birthday cards they've made around on their blogs. The Verve Blog would be a good starting place for that with all the Diva's links there on the side. Happy Happy Birthday, Julee!!! Party On, Dudette!! I hope to be back a little later with a VERY COOL project that Jen and I challenged each other to do! And it's from GLUE Art and Paper Studio!! woooOHOoooOOO! TIP: I NEED more sponges. That seems like my favorite thing to do these days. However, I only have 2 and they are completely yucked up (because I only have 2). In the absence of sponges specified for certain colors, use cottonballs. Not as great, but you can achieve a soft sponged look "eventually". This is gorgeous!!! Happy Birthday Julee!! What a gorgeous flower explosion! Love every little bit of this card. Thanks so much, Susan! Susie: FYI: go to Sally's Beauty Supply or Wal mart or where-ever and buy a bag of make up sponges...they work well and some of them are chiselled/angled which makes them even better. I love this card! So Cheery...it makes me smile. Such a cute card, Susan! I love all the happy colors! So cute, Susan!! We used the same sketch! Julee's gonna love this one. That bugged bg looks great! Love this card, super cute!